112 McLaren Lane is located in the West side of Bishop, off of Line St/Highway 168. This highly desired neighborhood is outside city limits with quick access to hiking and biking trails. This custom home offers 3 bedrooms and 3.5 bathrooms, living room, family room and formal dining area, adding up to 2,290 square feet. The home is full of bay windows, glass patio doors and skylights in dining area that fill the home with natural light. The large master bedroom offers additional space that can be used as office space or crafting area, private bathroom with walk in shower and over-sized Jacuzzi tub. This home is located on a corner lot, sits on 0.31 acres and 2 car attached garage. The garage offers an additional room that could be used as storage, workshop or craft room. The front yard offers two private ponds draped by a Willow tree for added shade for the front patio. Exiting the formal dining area you enter a gated covered patio which leads to the low maintenance backyard. This private backyard offers raised garden beds, fruit trees and detached storage shed. Automatic sprinklers for both the front and back yards. Rent includes: Landscape gardener, water, sewer, trash service, built in stainless refrigerator, oven/range, microwave, dishwasher, washer/dryer, fireplace insert, wood stove, F/A heat, A/C, and energy efficient evaporative cooler. 1 Year lease, no smoking, no pets. This upscale neighborhood is one of the most sought out areas in Bishop. The homes in this area have from ½ acre to 1 ½ acre parcels which can give you space and privacy from your neighbors. Some of the properties have year round ponds and streams that create a nice relaxing feel. There are lots of mature trees in the area which are nice to have during those summer months to add some shade to the properties. 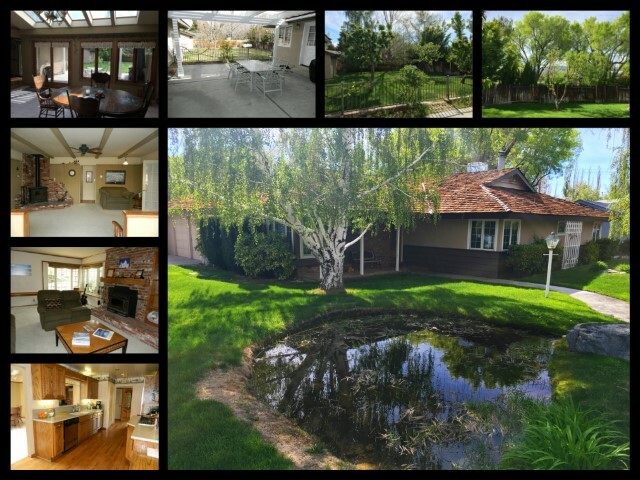 For more information regarding this rental, please check out our website MySierraHomes.com then click For Rent. Additional details available on request. Applications required prior to showings. $20 application fee covers Credit Check, Criminal Background Check and Rent Bureau Check. If you would like more information regarding the Property Management Services Eastern Sierra Realty offers, please check out the services we offer at MySierraHomes.com or contact us at (760) 873-4161.